History was made tonight on Big Stone Lake as Paul Ell of Big Lake, MN brought in the largest walleye ever weighed on the certified scale at Artie’s Bait & Tackle and former Bud’s Bait in the last 20 years! 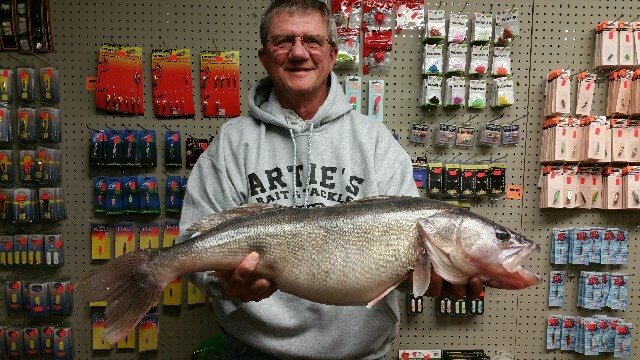 The walleye tipped the scale at a whopping 11.61 pounds and measured 29.5 inches! Paul Ell was fishing on Big Stone Lake in 8.5 foot of water and was using a green/silver 1/4oz kastmaster tipped with a minnow head. Ell said the fish bit at 6:10pm (February 26, 2015) and battled for at least 2-3 minutes and made 4-5 runs! Ell is planning to mount his walleye. Ell has fished Big Stone Lake for many years and has a cabin on the lake. Walleye season will come to an end this Sunday March 1st and will reopen April 18, 2015.